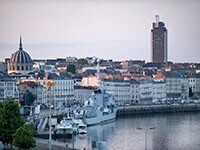 Region Nantes is the sixth largest city of France. 281 lives here 800 people and more than 5000 tourists come annually. Company IKEA in 2002 has opened in this city its first store.